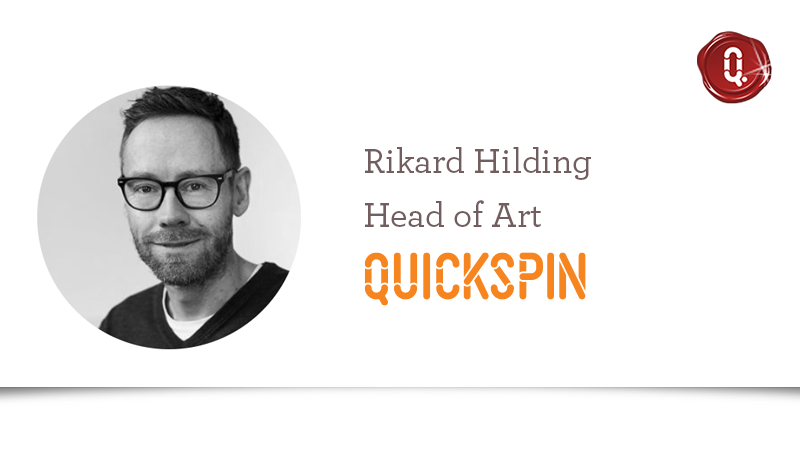 Rikard Hilding is an extremely skilled graphical artist and the excellent leader of the art department at Quickspin. Rikard has been in the company over 6 years, and we asked him a few questions regarding our graphical approach. Where do you and your team find inspiration? It varies of course from Artist to Artist but games, animated movies, concept art, classical art are popular sources. Personally, I also get inspired a lot by the world outside the window and advertising in all shapes and form. Other slot developers’ games can be inspiring but are not of major importance to us, we try to do our own thing. What is important from a graphical point of view when creating slot games? That the graphics and animations are fully synced with the math design and features of the game, this includes correct symbol- and FX- hierarchy. That the graphics matches the volatility of the game, there are some themes that we just wouldn’t do for a very volatile game. We always try to have fun with the themes we pick, which I do think shows in our games. What Quickspin game do you think have the best graphics? That´s a very tricky question… I´d say the slot that fulfills the criteria in the previous question. Big Bot Crew, Dwarves Gone Wild, Eastern Emeralds and Big Bad Wolf does this, to mention a few. How many art people is needed to create a slot game? In an average production three Artists will be involved. What I love the most is to have fun working with all our awesome Artists and all other great colleagues at Quickspin, to dream as big as possible and solve the problems that derives from that. Would you like to see who is working with Rikard in the art team? Have a look at our Career page!